We arrived at the hotel 5 hours late as a result of our flight been delayed. When we arrived at reception we were told the hotel had no room for us! I showed them our Direct Holidays accomodation vouchers but they still insisted we had no room there. After 30mins of discussions/arguments a room was found for us. Disappointment on arrival due to quality of hotel. The room we stayed in had wall paper peeling off the walls with old basic furniture. Beds were hard with bed spreads dirty and torn. Sheets had holes and were that thin you could see the mattress through it as there was only one sheet on the bed with no mattress protector. Daily cleaning poor, often not done till five pm.cockroaches seen in restaurant,hallway and information room, (this was durring the day when they don't usually appear unless dark)ant problem in the resturant during breakfast was dealt with by spraying them whilst they were on and around the selection of bread,the bread was left where it was for use of guests. Wall paper also had been ripped off on the third floor corridor next to the lift. Food was average, however little choice for vegetarian diet, lived on bread,pasta and potatoes both weeks with the odd pizza for a change!!!! Picnic pack up very poor. Hotel location reasonably good, quiet area. Staff hard working and were friendly and helpful overall. Would not visit hotel again, should be 2/3 star hotel. We arrived at 8pm and were quickly checked in by the friendly and efficent receptionist and went to our rooms which were clean and spacious, and were cleaned every day with fresh towels when we wanted them. The hotel was cleaned every day including sunbeds and pool area which were washed washed down as well. The breakfasts at the Hotel were fine. but the evening meals were not what you would expect from a 4 star hotel the choice of both salads and main course were woeful. The hotel is in a superb location with a pleasant 10 minute walk in to the centre, although there are also restaurants and bars close by the hotel. The entertainment was provided by Thomas Cook with Sarah and Ollie trying their utmost but as most people went out in the evenings there was not much encouragement for them. Stayed at Anmaria for week in August, group of ten of us, six adults, four children. Lovely spacious hotel, huge pool separated by bridge over. No problems with getting sun bed. Sometimes there was sun beds available up to lunch time and this was in peak August time. Slight breeze to cool you down. Big grass areas by pool which made the hotel feel very spacious and none claustrophic. Food was not as good as last year's hotel but made up for it with more desserts! Rooms lovely, fresh towels daily if required. Also can hire pool towels, pay deposit and get back at end of stay. You can change these for fresh every day too. Can also hire fridge and safety deposit box. They do not provide tea/coffee making facilities in room so we took travel kettle. Thomas Cook have entertainment team there - all very friendly and worked hard. Very close to the centre of Ayia Napa but were not bothered with any noise at all. Beach at end of hotel not that good but suggest Macronnisis or Golden Sands for family beach rather than Nissi which is for youngsters. Cost about 5 cypriot pounds in taxi. All in all had lovely holiday, only slight dampner was food but rest made up for it. If you decide to go out for meal one night make sure you visit Blueberries Restaurant in Ayia Napa. They do have website you can visit before you go. John and Chris own the restaurant and they are just lovely. We stayed here for 2 weeks and could not fault the place.pool brill,food was fine ,room spotless and staff and entertainment team made our holiday. Was our second time here and will not hesitate to return again.. I went to this hotel with my family - 2 teenagers and my wife. The hotel is clean and the staff very friendly, the rooms are well cleaned and the location is great, close enough to the bars but also just far enough away if you dont want to get into the full clubbing scene. My 2 daughters did want to do this and both Abi @ 17 and Becks @ 14 really enjoyed the clubs, we went with them of course but we didn't see any trouble anywhere in the resort or near to our hotel. It was great walking home at 5 AM without feeling at all nervous ! The only issues I would have is that the food in the hotel is dreadful !!! Veg is like bullets and the Tea is V bad !! You know what its like when you need a cuppa in the morning ! Also no Tea making facilities in a 4* hotel ? I'm certain that its not a heated outdoor pool so beware if you like pools as much as we do, my kids OR wife wouldn't go near it !! Lastly, the Thomas Cook entertainment team, they really tried there very best, BUT all I would say to you, Donna and Ollie and Sarah is to put on a Karaoke every night as well as the Bingo, that's all we really needed !! But well done anyway !! We went here as my sister was getting married to a Greek man. Have to say this is one of the nicest hotels that I have stayed at. The staff was friendly, polite and it was very clean. It was fairly quiet, but I did really enjoy myself and Iam hoping to go back in September. The food was not all that, but there was always something to eat that I did like, even though it would be something small. This hotel provided us with a superb, great value family holiday. All staff and Reps were fantastic and very helpful, in particular when our taxi never turned up to take us back to the airport, they provided us with other transport. The hotel was spotless, towels changed daily and cleaners exceptionally friendly! 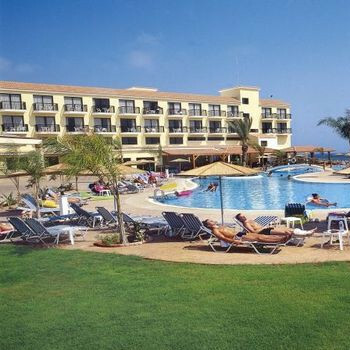 Brilliant sized swimming pool and excellent watersport entertainment throughout the day! Good variety of food, international theme nights each night (if you stay for 2 wks they have two different menus).